'knowledge iceberg' - "...depth beyond the depth." "... to employ a well-known metaphor, that all we can see is the tip of the iceberg, and that there is depth beyond depth below it." - Michael Gilbert, The Etruscan Net (1968). Or... one word (maybe image) carrying meaning across. The Oxford Dictionary definition suggests the following: "A figure of speech in which a word or phrase is applied to an object or action to which it is not literally applicable." With this example: ‘when we speak of gene maps and gene mapping, we use a cartographic metaphor’. As such, a map is like a metaphor for the geographic area in which it endeavors to represent. Like a lawyer 'representing' a client...? 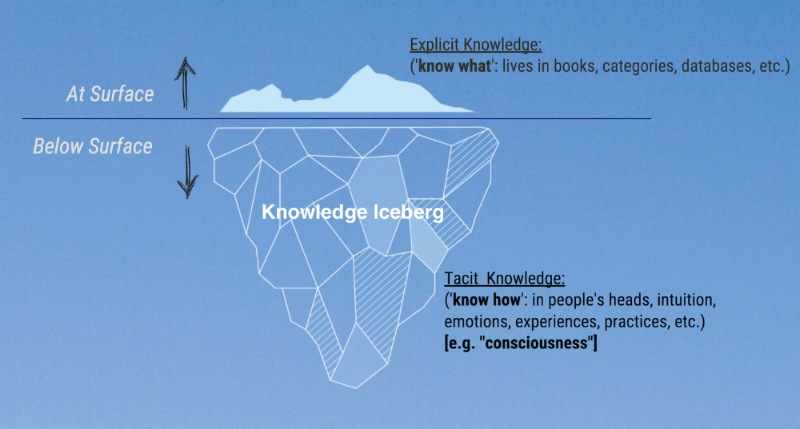 However, what I am pondering here is the somewhat worn cliché of using 'icebergs' and the 'tip of the iceberg' as metaphor for words and concepts, which in fact have much depth beyond the depth - as the 'Knowledge Iceberg' portrays above. In my current research this includes terms/concepts: "Knowledge", "Information", "Education", "Learning", along with culture, curriculum, technology, communication, and others. 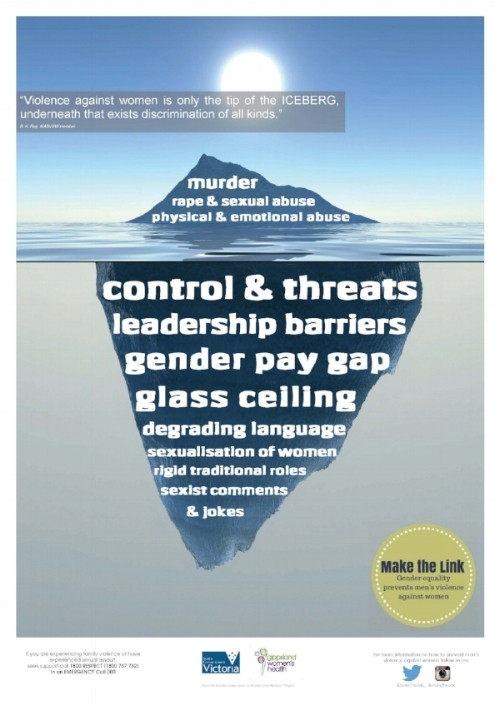 The iceberg metaphor is quite common in discussions of 'culture' and its many complexities. (This metaphor also has it's critics). Or how about the iceberg of success that seems to be making the rounds on Linked In..
Philosopher and poet Jan Zwicky (in Wisdom & Metaphor) suggests that "Metaphor is a species of understanding, a form of seeing-as: it has, we might say, flex. We see, simultaneously, similarities and dissimilarities." In metaphor we experience a gestalt shift from one distinct intellectual and emotional complex to another "in an instant of time". A metaphor, then, is also a meta-image. It is multiply resonant. This rings of another Canadian scholar Neil Postman (in his book Amusing ourselves to death, 1985) suggesting that 'resonance' and "through resonance a particular statement in a particular context acquires universal significance". Yet this seems to go beyond simply phrases and sentences. It seems objects have resonance. Even entire countries, or the idea of a country (e.g. Canada) have resonance. Yet, the idea of a "country" or maybe more a 'nation' is an iceberg-like concept, isn't it? Postman continues in discussing metaphors and resonance, suggesting they have "become the map of our imaginative world." "...Whatever the original and limited context of its use may have been, a medium has the power to fly far beyond that context into new and unexpected ones". English writer and professor Robert Macfarlane, in his most recent book Landmarks speaks of the importance of words, and of metaphor. "Words are grained into our landscapes, and landscapes grained into our words." For anyone immersed in, or learning about Indigenous place names, will most certainly recognize resonance in this thought. Macfarlane quotes American geographer Yi Fu Tuan in proposing that "it is precisely what is invisible in the land that makes what is merely empty space to one person, a place to another." The point I raise here is that of communication - and of Ignorance. Is not what lies mostly unseen below the surface of any concept, viewed as a metaphoric iceberg, essentially ignorance? What if I was to propose an iceberg for the concept of Imagination? What terms would fill the many facets of this iceberg, below the surface? If you and I were having a discussion about 'education' - which facets would we be discussing? Would we know implicitly which facets? Would it be the components of 'education' clearly visible above the surface, or below? What if we were having a disagreement - would that disagreement be actually based on a common understanding of the concepts up for debate? To wrap this post up (another metaphor) - what if we take the iceberg metaphor a little further, a little 'deeper', a little more 'upstream'... where do icebergs come from? Icebergs come from a source of ice. (Yes, complex, I know). Thus... if icebergs come from somewhere, can we take that a bit further when we explore metaphoric 'bergs? Not to mention that icebergs do eventually melt and return to where they originally, originally came from - part of the water cycle. However, the point of the matter here is that the worn (melting?) iceberg metaphor can be effective in portraying rather complex concepts (often pondered as simple above surface words) - but, do we think these concepts deep enough? And how do we ensure we are talking about the same things - or at least similar facets of the concept, that the word(s) represent - e.g. "culture"? If 'knowledge' is in fact a complex concept with much 'hidden beneath the surface' - when we speak of knowledge-based economies are we looking far enough below the surface, before we make decisions? What if "learning" is an iceberg concept? How do we design for 'learning'? Why that way? Who gets to determine what should be learned? How do we determine that that expected learning, was in fact what occurred? Whose learning was it? Why was it that learning that was 'taught' or facilitated? If we are working to design "learning organizations" - what do we design for? Why? Who determines that? Who evaluates that? Who rinses and repeats when necessary?